BBC NEWS | UK | Magazine | Could your airline fend off a missile? Could your airline fend off a missile? Some airlines want it, some can't afford it and some may already have it - the technology to defeat a heat-seeking missile is complex, costly and controversial. But as terrorists' tactics change, it could be a life-saver. The arrest last week of Briton Hemant Lakhani in the US has reawakened fears that the next time terrorists down an airliner it could be with a missile. 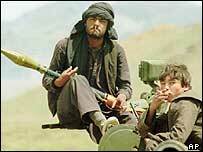 Mr Lakhani has been charged with trying to sell a portable missile to an FBI agent posing as a member of al-Qaeda. It follows a failed attack last year on an Israeli passenger jet over Kenya with shoulder-launched rockets, and comes at a time when BA has grounded all flights to the east African state and Saudi Arabia. Such events seem to have opened a new, and deeply disturbing, chapter in terror tactics. These would seem to be the weapons of choice for the hit-and-run terrorist. They are relatively cheap and can be fired quickly, even from the sunroof of a car parked outside an airport perimeter fence. Although such weapons have a limited range, passengers jets are vulnerable shortly after take-off and before landing. What's more, the weapons are available. For example, roughly 400 of the Stinger rockets America supplied to anti-Soviet forces in Afghanistan in the 1980s are still unaccounted for. So what, if anything, can be done to protect passenger jets from this new threat? While some military aircraft, particularly smaller ones, are fitted with defence systems to protect against small missiles, most commercial planes are not. But, in Israel at least, that is about to change. 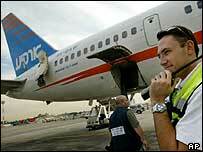 El Al, the national carrier, already has protection systems. Following the attack last November, all other commercial carriers will follow suit. 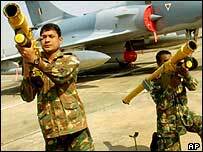 In some cases, scattering "chaff" - fine filaments of aluminium - is good enough to throw a mid-air missile off target. The tiny strands of metal create a "shadow target" designed to confuse the electromagnetic signals given out by a plane. But this is of little use against advanced, heat-seeking weapons such as the Igla SA-18, which Mr Lakhani is accused of trying to sell. These are equipped with an electronic guidance system which pinpoints the heat of an aircraft's engines. Instead of chaff, lighted flares are dropped by an aircraft; their intense heat drawing the missile off course and into a mid-air explosion. That's fine for the military, but in built-up areas around airports there would inevitably be strong opposition to the use of flares which may be a fire hazard when they land. A safer, but more costly alternative would be lasers. Last year the Pentagon agreed to pay $23m to fit laser protection systems to four C-17 military cargo planes - an aircraft similar to the Hercules. Missile warning sensors, which sit on the fuselage, scan for approaching rockets, looking for the ultraviolet and infrared plume of a missile. Sensors are set to distinguish an aircraft engine from that of a missile, which burns at a much higher temperature. Once the rocket's trajectory is logged, a "jam head" fixed to the plane fires a high-intensity laser which confuses the warhead, sending it off course. This all happens in a split second and the system is fully automatic, so demands no intervention by the pilot. But will airlines, which are already strapped for cash, splash out the $2-3m per plane it costs to install this sort of equipment? For David Schmieder, a senior research engineer at the Georgia Tech Research Institute, they should be thinking less about stopping missiles and more about limiting the damage they might do. "These sort of missiles are too small to take out a passenger jet on their own. They aim for the engine, but commercial jets are designed to cope with losing an engine and can fly on just one. "The problem is in secondary effects - the missile could send shrapnel to puncture a fuel line or gas tank, causing disaster." Making the fuel tanks inert or toughening components are two possibilities, says Mr Schmieder. One theory, says expert Jim O'Halloran, of Jane's Land-Based Air Defence, is that some airlines already have this equipment installed, but don't want to alert terrorists and alarm passengers. Some believe this is why the missile attack in Kenya last year failed. Indeed, British Airways refuses to discuss the issue, fearing it would "compromise security". It would only say it takes "preventative measures against a number of external threats". Aviation specialist Chris Yates spurns the theory. "Of all the world's civil aviation fleets, 99.9% do not have these measures in place. If you look at a carrier such as United in America, they're in Chapter 11 insolvency," says Mr Yates. "They last thing they can afford at this point is to spend hundreds of millions of dollars on a security measure they might not even need."